Esmeralda features a curated selection of stylish jewelry, accessories and gifts in collaboration with handcrafted artisans and family businesses located in the US and abroad. A great store with a very friendly woman working there. She was very welcoming which just added to the charm of this store. A unique affordable collection from many different artisans. A great place to find gifts. Beautiful jewelry. They make perfect gifts. I found the cutest earrings! Origami! Very cute store! More variety in terms of necklaces and bracelets (both in style and price range) would have been nice. Great customer service and mix of jewelry styles! Wonderful gifts! Friendly, excellent service! I'm so glad you sent me another Nift gift thank you!!!! I did not know Esmeralda was in Harvard Square and I go there at least twice a week. I was able to purchase a beautiful pair of earrings using your gift. I will definitely be going back to the store especially for gifts to give to friends and family. Esmeralda had a great selection of jewelry. I picked out a necklace I liked, but there was a problem with the catch. The woman running the store replaced the chain & catch within minutes, and I bought the necklace. It was a great experience! The gift was great! It was, however, very annoying to continue to receive emails nagging me to use it when I’d already done so. Great selection and helpful staff! I got just what I was looking for. Thank you!! My wife was very pleasantly surprised by Esmeralda. She also thought Nift was a great way to encourage us to visit the store, and we're looking forward to returning to Esmeralda on our own in the future! The jewelry is gorgeous and the prices were also very reasonable. Plus their staff was the sweetest. The woman working was very kind, helpful, and welcoming! Beautiful selection. Pretty jewelry, good prices, helpful staff! The gift was very nice. I got a lovely pair of earrings from Esmeralda. The woman working there was very friendly and told me about the store's concept. I would recommend Esmeralda to a friend. I think NIft is a great concept! Esmeralda’s is a quaint little shop with lots to offer. All of the work is from local artists which is awesome! Great choices! Everything is homemade and from fair trade sources! Woman there was very helpful and friendly. It was a very pleasant experience shopping at Esmeralda. The owner was very welcoming, and the jewelry had a lot of variety and was very nice, and not too expensive. the scale below didn't work. I would give the store a 5, especially for young people. Lots of nice well priced items and pleasant atmosphere. I hadn't been to Esmeralda before. It is a lovely shop, and the owner told me that all the jewelry is equitably made and paid for. Esmeralda had beautiful jewelry and very affordable... much of the jewelry was made by local artists. I bought two bracelets and a decorative hair pin that was hand beaded into a dream catcher! unique and inexpensive jewelry in the heart of Harvard Square I would rate this store as a 5. The Nift was great! Helped me buy new earrings for my wedding. The jewelry was gorgeous (and I made a purchase) but they need some music or something for ambiance. It felt awkward and cold Shopping in there! Got something beautiful, enjoyed talking with the staff! Nice merchandise, pleasant staff. Good products from small companies. Lots of cute and unique stuff! Got some great Christmas gift finds. Good selection of jewelry. Very nice sales person who was very helpful. I especially appreciate that Esmeralda has such a wide range of jewelry styles, so you could shop for people with very different tastes here. Very nice selection of jewelry from around the world. Paula, the woman working in the store, was so friendly and helpful. Beautiful inventory at reasonable prices. Very impressed. Found a great pair of earrings for my sister - thanks! the store was amazing and cute and I loved the necklace that I got. It was a really great gift. It's a wonderful store! The prices are very reasonable, too. Esmeralda is a cute store with a great selection of jewelry that pops but doesn't overwhelm. Wonderful experience - great service! Cute shop with lots of local products and the woman there was super nice! A great opportunity to support socially conscious jewelers who make beautiful pieces! Great store! Lovely jewelry! Excellent service! Really nice jewelry store with a great selection! Very nice owner, as well. I bought some adorable amber earrings, love them! Very friendly staff and lots of personalized attention. The shop is small but has items for a variety of different tastes and price points. An eclectic mix of jewelry, scarves, and crafts. Great prices. I love the sea glass earrings that I purchased. I'll be back for more. The person at the counter was very nice when ringing me up. There was a problem with my email not letting me click the button to redeem the Nift in store, but that didn't prevent getting a discount. I was only discounted $18.82 from the $20 certificate, but didn't notice until I was already home. Either way, I will go back to the store as I enjoyed their selection of merchandise. Very friendly and helpful staff. Would recommend to others. A lovely store. I saw several things that I would like to buy. Great store and amazing service! Store was well organized and had a great selection of beautiful jewelry! This was great! So many options and they're all beautiful and unique, but not that expensive!!! I always have the impression that buying jewelry in Harvard Square will always break my bank. Glad to know that's not the case. This was a great experience! Love that the jewelry is locally sourced! Esmeralda is a beautiful, locally-owned, craft jewelry and soaps gift shop. The employee was welcoming when I visited and knowledgeable about the products Esmeralda was selling. I looked at their site and products online before visiting. I had intended to buy myself a fashion ring after browsing online, but at the store, I found a pair of pearl earrings and a necklace that I liked so much more in person! I recommend visiting this store for gifts for your girl friends, family, and yourself! Esmeralda was such a sweet shop, with a great model -- supporting local artists and sharing their craft. I hope the shop continues to gain exposure and develop a growing customer base. I will go back there for future gifts! Beautiful pieces, and the owner clearly cares a lot about sourcing her jewelry responsibly and curating the selection! Lovely place to buy a gift. the jewelry wasn't really my style but I had a lovely chat with the owner and I love how everything is local and fair trade, which is so great!! Adorable shop with a very friendly owner. Everything in the store is handmade by small business owners. Great shop for gifts and a little glam! This was a lovely surprise to get a Nift gift! I picked out a beautiful piece of jewelry and was warmly received by the employee working at Esmeralda that day. Thank you! Unique jewelry, very nice sales staff! Cute store that supports local and international artists. Very pretty store with lots to choose from, all very flashy and sparkly - for the most part. Definitely a place to find great special occasion jewelry. Nice store. It seemed like the person attending the store was on a personal phone call and it would have been nice to be greeted and asked if I could be helped. She was very nice and helpful once I asked if I could ask a question. Great selection of jewelry and wonderful customer service. 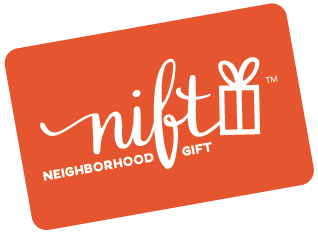 I think Nift is a great way for people to learn about local businesses in their area. I would never have known about Esmerelda had I not been given a Nift gift card. I could have bought the whole store. Beautiful jewelry at reasonable prices and a lovely and helpful saleswoman. Esmeralda store is a gem! So glad I discovered it. Thank you! Great little shop, all local products, friendly owner! I love all the different jewelry and knowing that many of the jewelry was made in different countries all over the world and that the proceeds go back to help those in need. Very nice selection of Jewelry and some scarves and soaps. The owner was so helpful. Very personable as well. Such a fun store with lovely jewelry. I love my new silver earrings! And the owner was friendly and helpful. Very friendly place. I also loved that they sell hand made items. Shop is small so selection is a little limited, but nice. Prices were very reasonable! Store with helpful staff and a lot of beautiful items. I really enjoyed the store. What the store lacked in its size, it more than made up for it with the wide and unique selection of pieces. I will definitely return and took some business cards to distribute. Great store, glad I discovered it through Nift! Beautiful earrings! Great options all around. Lovely jewelry and interesting accessories! I would return to shop there. What a wonderful selection of unique jewelry- so nicely displayed! Thanks, I'll be back soon! Friendly sales lady too. Cute, giftable items in a cozy shop. Adorable shop-smelled great! And I felt very welcomed! The ring was great! A few of my co workers have asked where I got it even. Had never been in Esmeralda before. Many cute pieces of jewelry. Much appreciated, great choices and easy to use! beautiful handmade jewelry reasonably priced. Very beautiful jewelry at great prices, lovely saleswoman. Thank you for giving me the opportunity to learn about and support a local small business! Shop was very nice, cool jewelry. Girl working was very nice as well. Paula was lovely and the jewelry selection was amazing! The website won't let me select five but I of course give my visit a 5/5! Esmeralda is a very nice shop with an interesting selection of handmade jewelry. I loved exploring a new store that I had never been to before. The sales associate was super friendly. I would definitely go back there, with or without a gift incentive. Thank you! They have more than jewelry and a wide range of prices. It was nice to support a small business. The shop is small and has unique pieces which contribute to the pro "shop small" atmosphere. Some of the pieces were pricier than I expected but I am excited about my purchase and the nift gift! Large range of good quality products, very accommodating shop-keeper. very nice shop with unusual and fabulous finds! Adorable shop. Esmeralda is so sweet and helped us find the perfect gifts!